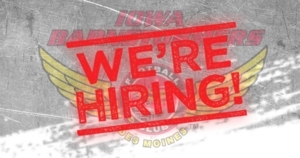 The Iowa Barnstormers are seeking energetic, motivated, and hard working individuals to join their team! The Barnstormers currently have full time, seasonal, and part time employment opportunities available. The Iowa Barnstormers are seeking an outgoing and hardworking individual to join their sales team! Account Executives will be responsible for prospecting, developing business relationships, and servicing clientele while focusing on selling both season and group tickets. Strong customer service skills are recommended. Please click here for more information. The Iowa Barnstormers are seeking a hardworking and detail oriented individual to join their team! The Equipment Manager will be responsible for coordinating and organizing all equipment needs for the football team and coaching staff. The Equipment Manager will work alongside the front office to order all necessary supplies needed, inspect and repair equipment as needed, and keep inventory throughout the season. The Equipment Manager will also attend necessary practices and all home games to ensure that equipment needs are being met. The Equipment Manager will also have the opportunity to travel with the team to ensure that all equipment needs are being met while on the road. Please click here for more information. The Iowa Barnstormers are seeking a poistive, energetic, and fun-loving individual to join their team as Billy the Barnstormer! The Mascot will attend all Iowa Barnstormers home games to participate in the team's in-game promotions and visit with fans. The Mascot will also attend several events in the Des Moines and surroudning communities throughout the year. Please click here for more information. Keep an eye on our Jobs page for all future openings! Information on our 2019 Internship Opportunities is coming soon!